The recent Redmond High graduate was named the 2017 Washington State Good Citizen Winner by the Washington State National Society Daughters of the American Revolution (DAR). 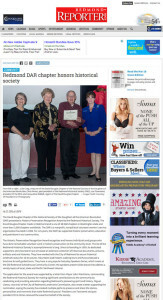 The David Douglas Chapter of the National Society Daughters of the American Revolution (NSDAR), Redmond, awarded former Redmond Mayor Christine Himes its 2016 Women in American History Award. 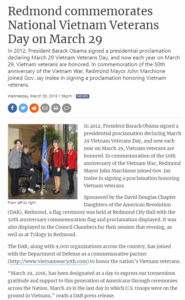 In 2012, President Barack Obama signed a presidential proclamation declaring March 29 Vietnam Veterans Day, and now each year on March 29, Vietnam veterans are honored. At the eleventh hour of the eleventh day of the eleventh month of 1918, the guns finally fell silent across France. Peace broke out that day, and soon ‘Johnny came marching home’ back to the US. 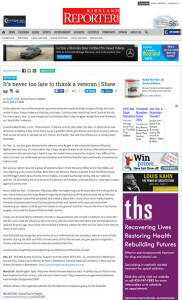 For many years, Nov. 11 was recognized as Armistice Day, a day we gave recognition and thanks to our World War I veterans. The David Douglas Chapter of the National Society Daughters of the American Revolution presented an Historic Preservation Recognition Award to the Redmond Historical Society. 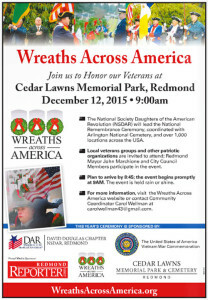 The David Douglas Chapter of the National Society Daughters of the American Revolution of Redmond will conduct a Wreaths Across America ceremony at 9 a.m. Dec. 13 at the Cedar Lawns Memorial Park and Cemetery, 7200 180th Ave. 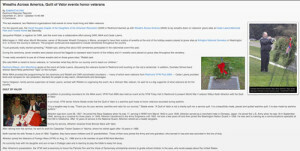 N.E., Redmond. 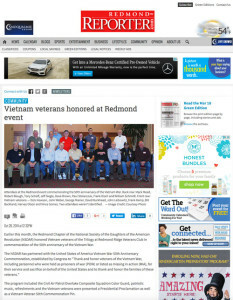 Earlier this month, the Redmond Chapter of the National Society Daughters of the American Revolution (NSDAR) honored Vietnam veterans of the Trilogy at Redmond Ridge Veterans Club in commemoration of the 50th anniversary of the Vietnam War. 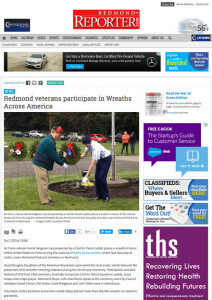 Air Force veteran Harris Helgeson (accompanied by a Civil Air Patrol cadet) places a wreath in honor of the United States Air Force during the national Wreaths Across America event last Saturday at Cedar Lawns Memorial Park and Cemetery in Redmond. 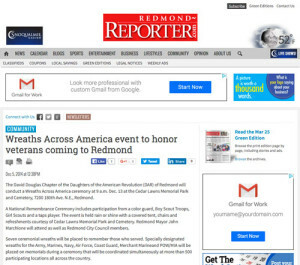 This last weekend, two Redmond organizations held events to honor local living and fallen veterans.